When the three-year-old freighter R. L. Ireland stranded on Lake Superior’s Gull Island in a snowstorm on Dec. 7, 1906, famed salvager Tom Reid of Sarnia was called to the rescue. Reid, who was taking over the operation of his father’s salvage company, was already gaining a reputation for his daring exploits. He took chances and saved boats that had been already written off by other salvagers and insurance carriers as total losses. The Ireland, owned by the Cleveland based Gilchrist Transportation Co., was not considered to be in serious trouble. The ship was on the rocks, with holes punched in its steel bottom, and her rudder was gone. The ship was taking on water but the crew was still on board and the steamer’s own pumps were keeping ahead of the water. Gull Island is a small outcropping of rocks in the Apostle Group of Islands at the western end of Lake Superior. At first it looked like an easy task for Reid’s crew. So easy, in fact, that Reid sent one of his employees, a Captain Brown, on the wrecking tug Manistique, to do the job. Brown may have been Capt. Claud D. Brown, a Port Huron native who also was a well-known tugboat salvage operator during that period. 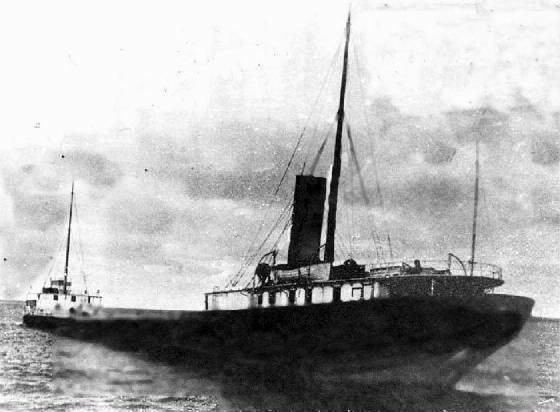 The Manistique was accompanied by a smaller tug, the Crosby, commanded by a Captain Minckey, to help pull the wreck back into deep water. The plan was to tow it to Duluth for dry dock. The project was in trouble from the moment the Reid tugs arrived. Winter storms pounded the Ireland and the seas were so rough that little could be done. By December 10, Reid was on the scene. He telegraphed the ship’s owners from nearby Bayfield, Wis., saying that he had high hopes of getting the Ireland off the reef if the weather moderated that evening. The storms abated for a few hours. That was all Reid needed. With both tugs pulling, the Ireland was skidded off the reef. Then a hawser was attached to the Manistique, and the big tug set off across Lake Superior with the crippled steamer in tow. The Crosby steamed along behind in case of trouble. Reid apparently took a train back to Port Huron, thinking that the problem was solved. Another storm developed and it turned out to be a dandy. The three boats took such a pounding that the Manistique broke a steam pipe. At about the same time the hawser snapped and the helpless Ireland drifted off. The two boats were separated in the storm. The steamer had an 18-member crew aboard and steam up, but it could not be steered because it had no rudder. Everybody thought the Ireland was going to sink. Captain Minckey brought the little tug alongside the drifting steamer and held it in place while the Ireland’s crew members climbed to her deck. It was a daring rescue. The seas whipped the two boats so hard that they repeatedly rammed into each other, causing extensive damage to the tug. Watchman Andy Daniels of Marquette missed his footing and fell to his death in the raging seas. Two other men, Charles Shipman and William Zimmerman, were seriously hurt when they landed hard on the pitching deck. Both men were hospitalized. When the Crosby steamed into Ashland, Wisconsin on Dec. 15, Captain Minckey believed that both the Ireland and the tug Manistique were lost. He was wrong. Captain Brown brought his vessel safely into Port Arthur, Ontario, two days later after surviving a terrible battle against the elements. The Ireland was found aground once again off Sand Island, and still intact. After getting the Manistique repaired, Brown returned to Sand Island and started salvage operations all over again. Steam pumps were used to get the water out of the ship’s hold. Once she was afloat again, the Ireland was towed successfully to Duluth. She arrived there safely on Dec. 29. The Ireland remained on the lakes under the names Sirius and lastly, as a Canadian-owned boat Ontadoc, until 1972. In the end, it was towed to Turkey to be scrapped.